For the past six years, Lebanon has been at the forefront of one of the most disastrous humanitarian crises of our time: The Syrian Crisis. The impact of the crisis further strained the already overstretched resources of Lebanon—the country now hosts over 1 million refugees from Syria. In order to face the repercussions of the protracted situation, a large-scale response continues to be needed to mitigate impacts on the most vulnerable populations in both displaced and host communities. In 2013, the Lebanon Host Communities Support Programme (LHSP) was launched jointly by the Ministry of Social Affairs (MoSA) of Lebanon and the United Nations Development Progamme (UNDP) under the umbrella of the country’s response to the impact of the Syria Crisis in Lebanon (Lebanon Crisis Response Plan – LCRP). The Programme targets the most vulnerable communities hosting displaced Syrians and aims to decrease tensions and conflict between host communities and displaced persons. Six national UN Volunteers have been assigned to the LHSP across different regions. Each makes important contributions by serving as mediator, with the goal of ensuring collaboration and peaceful co-existence from all sides affected by the humanitarian crisis. "Today, more than ever there is a need to support host communities and the municipalities. I do believe that we have geared up this assistance. The Lebanon Host Communities Support Programme has certainly been a landmark in the way we are responding to the needs here in the country," says Mr. Philippe Lazzarini, UN Resident and Humanitarian Coordinator and UNDP Resident Representative in Lebanon. The tangible outputs of the LHSP include increasing livelihoods and economic opportunities for displaced persons, strengthening the capacity of local officials in delivering basic services to refugees, improving local-level dispute resolution and community security, and strengthening the capacity of the Government of Lebanon to respond to the influx of displaced Syrians. 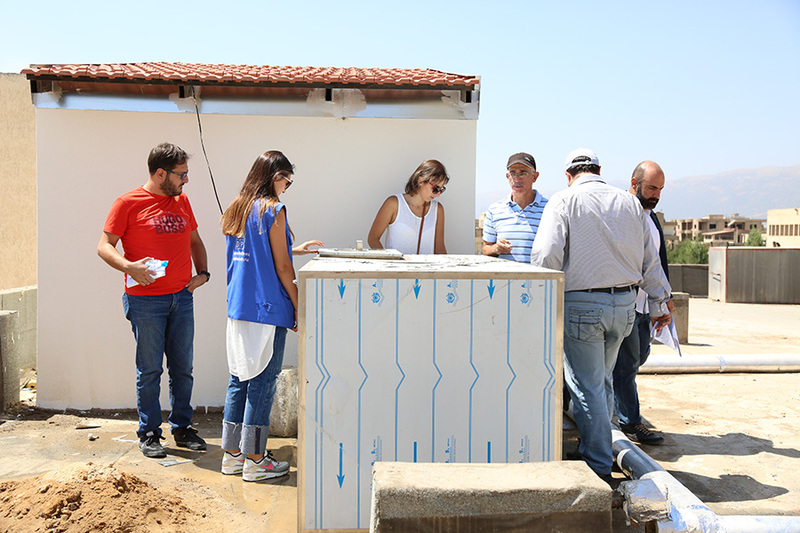 Making a difference in the most vulnerable communities in Lebanon gave the members of those communities hope, and in-turn allowed him to become a member of one of the most effective projects in mitigating the impact of the Syrian Crisis in Lebanon. “I was able to help others, and at the same time, I was helping myself become a better person. In the end, we rise by lifting others,” says Anthony Bou Moussa, a 23-year-old national UN Volunteer serving with the LHSP. Ms. Rana Sadder, a 25-year-old mother, is one of 680 youth who took part in the Youth Employability Project which provided young men and women with vocational and technical training, equipping them with skills that increased their chances of finding jobs. Youth support projects implemented through the LHSP are particularly helpful in reaching women and youth to give them access to decent work. The total number of people impacted by the LHSP projects has so far surpassed 800,000 (51% are women). I can finally say that I am standing on my feet again. I don’t think of the past anymore but instead look to the future and see how much this opportunity has changed me to the better and helped me create a new life,” explaines Rana. Ms. Nour Rahhal, Data Entry Assistant national UN Volunteer, was involved in monitoring the process of bio-psycho-social examinations in public schools, social development centers and in primary health care centers. She also drafted results of social and health plans and provided updates for her supervisor. Assuring availability of data through the LHSP has great importance when providing support to municipalities and building the capacity of local government institutions to assure displaced communities greater access to basic services.